Be it media events, premieres, research, events, press conference, professional activities or dates abroad: the international press card (IPC) opens many doors to journalists, media workers and press photographers. You will receive all press documents (all inclusive) for just 127 Euro and include the following services: Press Card, ID-Card, Press sign (car), Legitimation, Certificate and much more. 127.00 Euro one-time fee. 36.00 Euro per year. Includes the annual reissue. 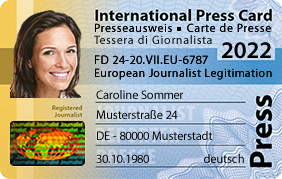 • Digital Press Card incl. 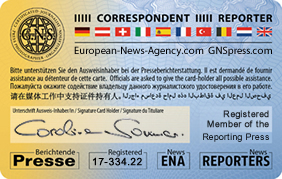 • Can I become a press card even if I am a non-EU national? Yes, of course. • Can I pay online? Yes, by PayPal or bank transfer. • How long does it take for application to be processed? Ono to two days. Press card, ID card and press sign for the car: request them here and secure your privileges.